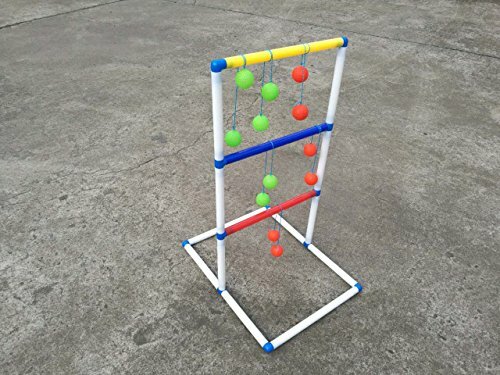 FixtureDisplays Ladder Toss Game Set with 6 Bolos Backyard Family Golf Games. This Ladder Toss Game Set includes (1) PVC target and (6) bolos (3 red + 3 green), great for outdoor lawn backyard games. Ladder toss game can help positively channel a child's physical and mental energies. Games play can also help a child improve concentration skills and teach the importance of task completion, they can improve their own self esteem. Group games help kids become more socially adept. Not only do kids improve their interpersonal skills, they learn valuable lessons about team spirit and healthy competition. This ladder toss game set is very easy to assemble and disassemble, no tools required. Target measures 18" width x 33.8" height x 22.8" depth. Weight: 1.3 lbs.